I’ve been meaning to write a tutorial describing how to use multiple audio devices with JACK, using the “alsa_in” and “alsa_out” tools, but as it turns out, I don’t have to now! Linux Home Recording is a new-ish blog that already has a number of great articles about various Linux recording topics, and the most recent post there is all about using alsa_in and alsa_out. It pays special attention to one of the most common cases — using a USB microphone — so it’s well worth a read. Easter is a holiday weekend in Australia, and the extra days off gave me time to get back to the piano-driven song that I’ve been working on for some time. I’ve had the arrangement largely complete for a while, so I quickly finished the lyrics and then recorded the vocals. Until now, this track was all MIDI in Qtractor, and I tried recording the vocals there, too, but I need a lot of takes to get a good vocal down, and Qtractor didn’t make that easy. 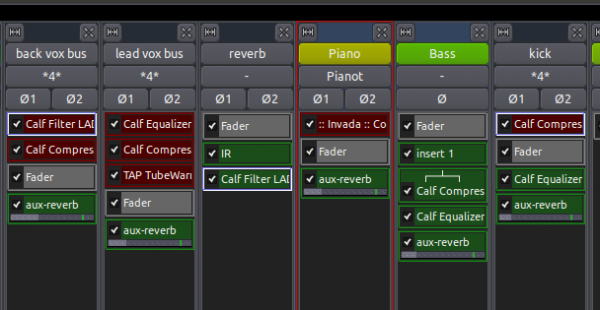 I suspected that Ardour 3 might, though, so I started a new session, synced it to Qtractor using the JACK transport, and recorded the vocals there. Ardour has long allowed you to record multiple takes in to the same track, but switching between them in Ardour 2 was time-consuming. 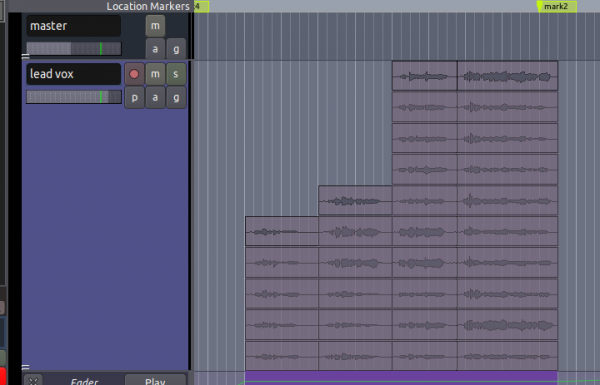 In Ardour 3, you can switch a track to “Stacked” mode (under Layers in the track’s right-click menu), which displays the overlapping regions within the track separately, stacked vertically on top of each other. In Stacked mode, you can see clearly what’s in each region (at least, once you’ve expanded the height of the track enough! ), and you can rearrange them by clicking and dragging. It’s also easy to select multiple stacked regions and run the same edit operation on them, such as splitting them at the playhead. It took very little time to split my takes in to individual phrases, and then rearrange and audition them to find the best takes for each part of the vocal. 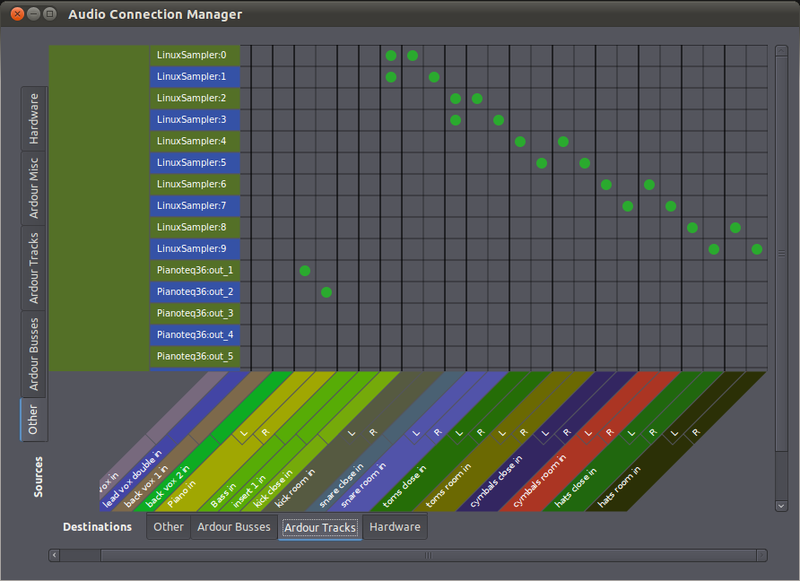 A more fundamental change in Ardour 3 is the new connection manager interface, which is a massive improvement on the old UI for managing connections to tracks, buses, and inserts/sends. It’s intimidating at first, but it’s really quite simple to use: it’s a matrix, with outputs running top-to-bottom on the left, and inputs running left-to-right on the bottom. For each combination of input and output, there’s a box on the grid, and clicking in those boxes creates or deletes a routing between that input and that output. In specific parts of the UI, you’ll just see subsets of this; for instance, if you open the connections for a specific track, you’ll see the potential outputs on the left, but just the track’s inputs down the bottom. However, there’s also a master connection manager (well, two really — one for audio, and one for MIDI, both available from the Window menu), which lets you make connections to multiple tracks or buses very quickly. After I finished recording my vocals, I decided to record audio tracks from my MIDI instruments in to Ardour so I could work with just audio for the final mix. 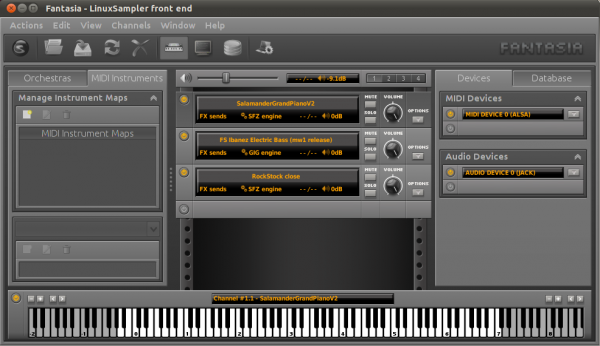 For the drums, I used LinuxSampler (discussed a little here), with five separate copies of Analogue Drums’ RockStock kit loaded (one each for kick, snare, toms, hats, and cymbals), each routed to its own pair of JACK outputs. In Ardour 2, it would’ve taken ages to connect those LinuxSampler outputs to my track inputs, but with the master connection manager in Ardour 3, it took just 10 clicks and about as many seconds. I’ve mentioned it before, but the aux bussing in Ardour 3 is great. Once I’d recorded all my instruments in to Ardour, I set up a reverb bus (a convolution reverb using the excellent IR plugin), and added sends from some of my tracks. Not only are they easier to add, but you can see and adjust the send levels straight from the mixer. 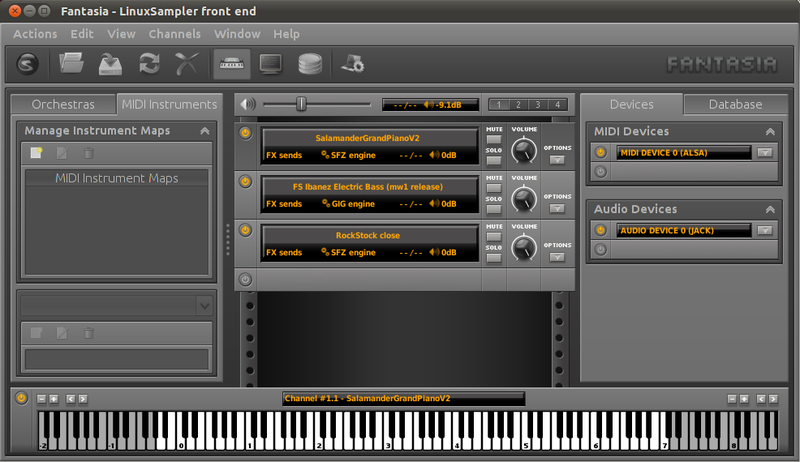 While I ran in to some problems with MIDI in Ardour 3 last week, working with just audio this weekend has been rock-solid. A lot of bug fixes have gone in to Subversion since the last alpha release, so I’m hoping we’ll see a beta release soon. Ubuntu 10.04, aka Lucid Lynx, is just a couple of days away, so I’ve been testing it on my laptop to see just how it’s coming along. I rely too much on both my laptop and my desktop to mess with new OSs before they’ve been released (or even just after they’ve been released), but I do keep a little 4GB partition spare on my laptop, so that I can install and test new releases without messing up my primary install. So far, it’s looking really good. The new visual theme is great to look at, and while it still insists on moving the close/minimise/maximise widgets in window title bars, it at least puts the close button in most accessible place, in the far left. It also has “teh snappy” — Firefox 3.6 on 10.04 snaps tabs around just as quickly as Chrome did on 9.10. I’m not sure what’s going on here, but I suspect it’s an Intel video driver update at play. In terms of music-making, 10.04 gets two big improvements: JACK is now in the “main” repository, which means that a bunch of apps that didn’t ship with JACK support in earlier versions now can (and do), and LV2 support is much more widespread, with major apps like Ardour supporting LV2 out-of-the-box, and more LV2 plug-ins (such as the Invada pack) available as standard packages. The JACK package now automatically sets itself up to get realtime priority access, removing a manual configuration step that’s often a stumbling block for users new to Linux audio. I spend a lot of time talking to Americans on the Internet, and they’re always reminding me that, due to the timezone difference, I live in the future compared to them. Today, though, I had a moment that reminded me that all of us really are living in the future. It was simple enough, really — I was sitting on IRC, and someone pasted a URL in to channel, but instead of linking to some lewd image from 4chan, it was a live stream of the recording session he had in progress in his home studio. Streaming audio isn’t exactly a new thing — Internet radio and live online concerts date back to the days of RealPlayer and dialup — but there was just something fascinating about being able to listen in on someone else’s bedroom studio as they put a track together, with everyone on channel listening and giving feedback, and even recording and emailing across their own snippets of audio. The best part of it all is that the technology isn’t that hard to get running. I installed Icecast on my virtual server, and DarkIce on my desktop at home, and before too long I had a live stream of my Ardour session up-and-running. DarkIce runs as a JACK client, so it can take its input from anywhere in your JACK signal path, and it can encode to Ogg Vorbis, which is supported natively in Firefox 3.5.